I was on holiday at the weekend up at Mansfield and decided to take a daytrip to Beechworth. Small shop, very well set out with the big industrial roaster out in the open. A lot of beans to chose from, staff very helpful. 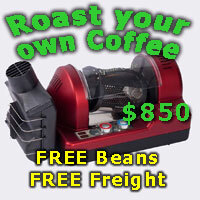 I selected a PNG single bean in a capp, very nice. Will be going back before the end of the year, hopefully i can supply more information as i did visit the brewery afterwards. If in Northern Victoria around this area, stop in and have a taste. I am interested if my tastebuds are up to standard. I am heading up to Beechworth weekend after next and will definitely drop in at Blynzz. A quick search shows it is still going so must be good. Does anyone have any other recommendations for Beechworth? Project 49 is good, Italian style. The coffee from the trailer in the old gaol is also good. The best coffee in the area is 30k away in Myrtleford at Coffee Chakra. Sounds like a good excuse for a bike ride. Did you like the coffee from Blynzz? Down Buckland Gap to the Great Alpine road, along the rail trail to Myrtleford, stop at Coffee Chakra for coffee and muffin. Out from Myrtleford on the Yackandandah road, turn left at Barwidgee Ck, up the back road to Stanley, descend to Beechworth. If you see a bearded bloke in a Lyrebird Cycles jersey at Chakra, say hi. I buy Blynzz Ethiopian Sidamo on a regular basis (I run a winery in Beechworth). BTW at this time of year the Chestnut musk as you go through Stanley can be a little overpowering. I should add that it's easiest to go over Taylor's gap on the Great Alpine Rd before turning onto the the rail trail about 300mm later: the trail is hard to get to from the Buckland Gap road corner. Ha, yeah, very tight corner. I've been drafting in autoCAD and writing specs for the machinist this morning and my woolly brain obviously defaulted to mm. Last edited by Lyrebird; 13th September 2018 at 02:17 PM. Is there such a good thing as good coffee in Malaga (Perth)?